Kingston was founded in 1692 after the demise of nearby Port Royal, the former capital, which was devastated in an earthquake. Port Royal was known as the 'wicked city', being the haunt of decadent aristocrats and swashbuckling pirates. The rich cultural heritage of Jamaica comes from a long history of conquerors including the Spanish and the British who introduced new plants, spices and a different way of life. The island gained its independence from Britain in 1962 but remained within the Commonwealth and still today counts the Queen as head of state although the title is mainly honorary. The main language is English although some local patois are still used by many of the people. Jamaica itself may have the image of being laid back and rather slow, but cosmopolitan Kingston moves at a fast pace, in keeping with its importance as the dominant force on the island politically, commercially and culturally. Some of the most affluent part of Kingston can be found in New Kingston, along Hope Road, Beverly Hills, Constant Spring, Stony Hill and Golden Spring. 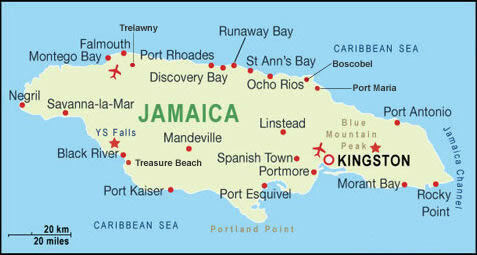 The island of Jamaica contrasts with long sandy beaches and inland rises to the slopes of the mountains from where the coffee beans are grown. There are over 252 species of birds on Jamaica of which 27 varieties are found nowhere else in the world. A holiday in Kingston is perfect for anyone who enjoys the delights of a tropical island dream, coupled with the fascination of a sometimes intimidating city. Many party enthusiasts travel to Kingston for its legendary clubs and nightspots. New Kingston is where the majority of visitors stay. The capital of Jamaica, Kingston jives to the beat of the infectious reggae music that was born here (mostly known as the birthplace of Bob Marley) and has swept through the world. It is the largest English-speaking city south of Miami, lying on a wide plain with the world's seventh-largest natural harbor to the south, and the Blue Mountains behind. A visit to Kingston wouldn't be complete without a visit to the Blue Mountains, Hellshire Hills, Bob Marley Museum, Devon House, Hope Gardens, Natural History Museum, National Gallery of Art and Port Royal.